In a relay race, the most exciting moments often come not at the finish line, but when the baton gets passed from one runner to the next. There is an exhilarating tension because, while the best runners can make it look so effortless, barely breaking stride, it is fraught with risk. Those same runners, with all of their training and talent, can sometimes still fumble the pass, drop the baton and lose the race in a moment. The risks of a fumbled handover aren’t just restricted to athletics. In Sales, the process of handing over the relationship with your customers from one part of the Sales team to the next is a similarly vulnerable point of transition. This is particularly true in a SaaS environment. In a traditional business, the race was all about making the sale. It was a sprint to the finish line, a surge to get ahead of your competitors. After bursting through the tape, there is no more running to do, it’s time to prepare for the next race, to win the next customer. In SaaS, the race doesn’t finish when you make the sale but instead relies on maintaining the relationship for the long term. Instead of a single runner sprinting around the track, you need a team of runners. Rather than a single point of contact throughout the relationship with a prospective customer, different members of the Sales team will be dealing with the customer along the way. The early running will be to convince a potential customer to sign up, while the later running will involve ensuring the customer finds continued success with your product and helping them to upgrade if they need to. The sort of customer engagement required at different phases of the relationship varies significantly and evolves as the relationship develops. You need different runners for different phases of the race. At Intercom, we have Account Executives and Relationship Managers handling these different phases and the passing of the customer baton requires careful consideration and good processes to be consistently successful. The Account Executive works on closing deals with prospective customers and does this by growing the relationship over time. During this process, they form an understanding of the customer, their priorities, work style, the key contacts, decision making process and any external factors influencing the relationship with Intercom. Account Executives have to build up a significant degree of trust with customers. With the transition phase in mind and with the aim of setting expectations, the Account Executive unveils any factors that the Relationship Manager needs to be aware of about their lifetime as a customer with Intercom. The Account Executive has to build up a significant degree of trust with the customer and if the handover doesn’t go well, that sense of trust is broken and really difficult to rebuild. Not unlike a relay event, a lot of effort goes into ensuring a smooth transition. After all the hard running made by the Account Executive, the last thing you want is for the proverbial baton to be dropped and the customer to become dissatisfied. That passing of the baton is a critical moment and if done right, the customer will barely be aware of the effort that has gone into making it appear so smooth. If done wrong, the customer will be all too aware of the lack of internal co-ordination and consequently feel undervalued. We’ve all had those maddening experiences dealing with a bank or a broadband provider, when the person who takes your call, listens to your query and passes you through to another agent who proceeds to ask you the same questions again, or even worse, offers contradictory information to the first agent. Then if you’re really lucky, they might pass you on to another colleague and you start all over again from scratch. Now imagine that frustration experienced over not just a single interaction but at a critical phase in your relationship with a company you’re doing business with. Needless to say, this is not the type of experience we want our customers to have. The onus is on the Relationship Manager to align with the Account Executive’s foundation. When the handover is fumbled like this, the experience is fragmented. It takes time to make introductions and provide briefings from scratch every time, and the loss of communication in the transition through internal departments can be detrimental to a customer’s experience. If the Relationship Manager is not perfectly aligned with the needs of the customer, they may mislead them in the usage of Intercom and as a result, the customer’s problems will not be resolved and their goals will not be accommodated. The onus is then on the Relationship Manager to align with the Account Executive’s foundation to understand what type of a customer they must now take care of and best cater to in the way they like to do business. In our team, we use a few techniques to ensure the transition goes smoothly. From the very earliest interactions with the prospect, we are actively trying to understand how they communicate and identify what their preferred behavioural style is. This is key to effectively build trust and rapport. Bonding and building rapport is important because people who are alike tend to like and trust one another, and people buy from people they trust. At Intercom, we use the DISC framework to frame and understand a prospect’s behavioral style. To pinpoint a personality trait, we look at two dimensions. Firstly, is the prospect more extroverted or introverted? And secondly, are they more people or task oriented? Dominant: Extroverted & Task-Oriented. This persona is strong-willed, tough, decisive, direct and sometimes impatient. Such a behavior could be seen as characteristic of a CEO or a person in an executive level role. Influencer: Extroverted & People-Oriented. The influencer is sociable, enthusiastic, open, spontaneous, emotional, persuasive and often talks more than they listen. This can make it hard to keep the conversation on track. This behavior is often seen with people who work in Sales or Marketing. Steady Relator: Introverted & People-Oriented. The Steady Relator is calm, sincere, non-emotional, risk averse, listens carefully, struggles being decisive and doesn’t like change or tough questions. This behavior can be often found in caring and supportive roles in a company. Cautious Compliant: Introverted & Task-Oriented. This persona is analytical, quiet, conservative, risk averse, systematic, logical, formal, disciplined, needs data to make a decision and doesn’t express emotions. These persons are often drawn to technical or data driven roles. 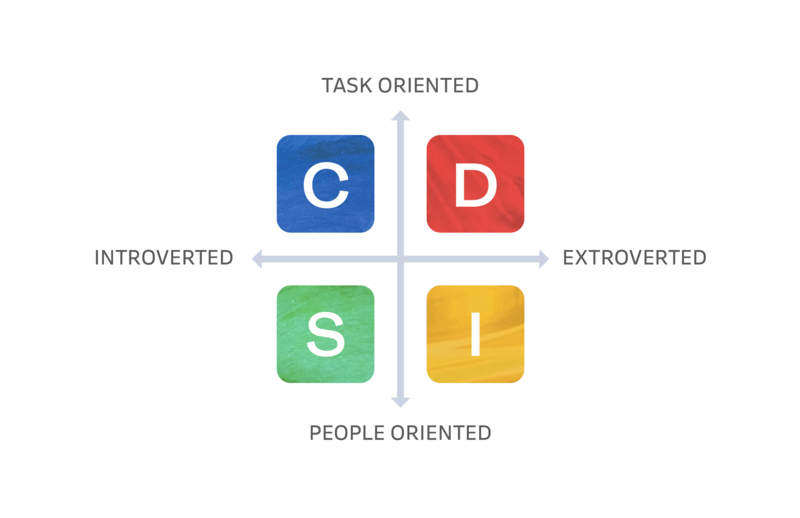 Needless to say, in the real world not everyone fits into these four behavioral types or roles neatly, but the framework offers a useful shorthand that allows us to quickly grasp what kind of personality we are dealing with. We understand that people buy products and services for a reason: to solve a problem or, as we put it, to get a job done. In Intercom we work off the JTBD framework in understanding what a customer’s Job-to-be-Done is, what their reason for considering using our product is. Without understanding this, it’s very hard to align with them and unveil the right product mix that will ensure the customer extracts the full value from the platform they choose. When a customer can see the value, the decision to buy is pretty easy. Account Executives conduct a deep discovery not on how prospective customers want to use Intercom but why. When customers see value, the decision to buy is easy. Why are they looking to purchase a new tool? What is the problem they are facing? What is the pain they are experiencing? What is the impact they need Intercom to make? This is the foundation we build upon in preparing a customer’s Use Case, which will ultimately be transferred over to the Relationship Manager to follow through. Anyone can come to our website and tell us that they want to use the Messenger to send messages to their customers. We could simply say, “Here’s ‘Messages’, that’ll do the trick”. By using the JTBD framework, we dig deeper to understand why they want to message these people. For example, they might want to increase retention and to do this, they want to be able to onboard new users to activate them in order to reduce churn. Once we are aligned on what needs to be done, we can work towards the goal together and ensure that the customer achieves success. Once the Account Executive has met and spoken to the customer, we keep internal notes about the customer’s JTBD along with information on their specific personality traits and where they fit in on the DISC framework. These notes evolve naturally as we move the customer further into the sales funnel. Once the deal is closed, it is time for the Account Executive to hand over the customer to the Relationship Manager, who will be responsible for the long-term success of the customer. This is the moment the baton gets passed from hand to hand, and it is where the internal notes become extremely important, as they give the Relationship Manager a chance to understand who the customers are, what their goals are, what issues or potential blockers have been discussed previously and how to communicate with the customer moving forward based on their preferred behavioural style. Knowing at a glance what the customer is looking to achieve and how to communicate most effectively allows the Relationship Manager to initiate credible and meaningful conversations from the get-go and continue to build a personal relationship long-term. a trust has been broken and that can be hard to rebuild. Underpinning all of these techniques is a fundamental belief in the power of building and maintaining personal relationships. It’s what motivates Intercom at large and we keep that to the forefront of our minds when using the DISC framework or identifying the prospective customer’s Job to be Done. You might have spotted the big difference between a SaaS customer relationship and a traditional one… There is no finish line anymore. In the past, the moment the sale was made functioned as a clearly demarcated finish line whereas now, the race never really ends. The customer relationship baton gets handed from runner to runner, each of them striving to nurture the connection. In this scenario, the gold medal goes to the company that can foster and nurture more of these relationships than their competitors. Which is why it’s so important that people get very adept at passing those proverbial batons in a smooth, swift action without losing stride.